Notre-Dame du Langbian Monastery at 2 Huyen Tran Chua Street in the Central Highlands city of Dalat is a unique monastery in Vietnam. 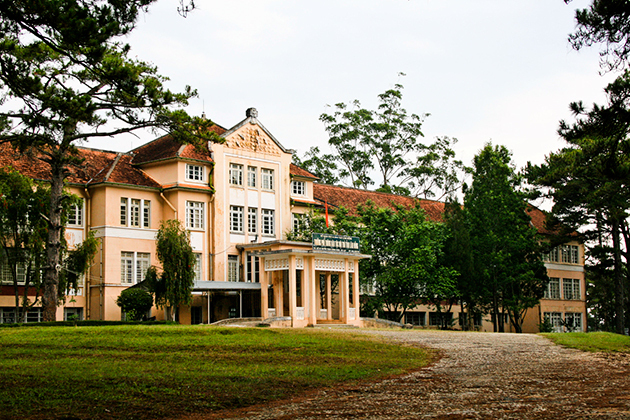 Built in 1935 by French nuns with support from Queen Nam Phuong, the wife of the last king of Vietnam, Bao Dai, the monastery is home to Counvent des Oiseaux School where female students from wealthy families in Dalat and southern Vietnam were educated between 1940 and 1975. Queen Nam Phuong was reportedly a student of this school as well. In front of the Counvent des Oiseaux, which is now the boarding high school for ethnic students in Lam Dong Province, is a pine hill where visitors can admire the hilly city. Entering the chapel area of Notre-Dame du Langbian, visitors can feel a typical quiet and mysterious atmosphere of a monastery, which makes it somehow resemble ancient monasteries in Europe.